Komodo National Park is home to the world largest monitor lizard along with pristine beaches, world class diving and some of the most beautiful lookout points you could ever imagine. Best of all Komodo National Park in Indonesia can be explored no matter what your budget. The major jumping off point for Komodo National Park is from Labuan Bajo. Here you’ll find a small one street, slightly shabby, port town with accomodation, food and plenty of tour operators. 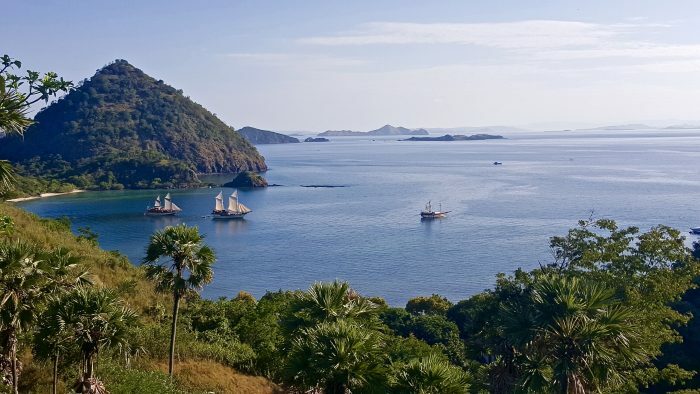 Most people base themselves in Labuan Bajo and visit the park on day trips, over night trips, or liveaboard dive boats, all of which are a great way to experience the park. Komodo National Park is open 365 days per year. However, from January to March (the rainy season) many tour operators and dive shops do not operate. 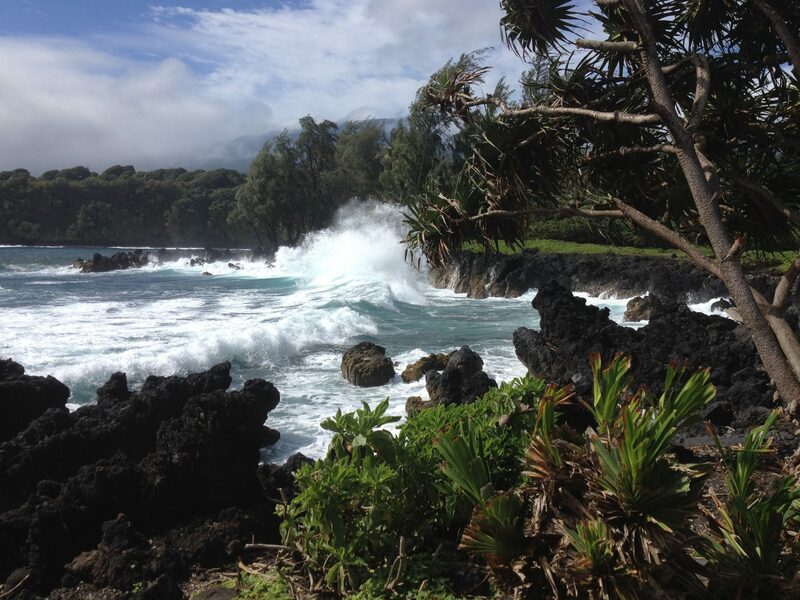 Strong winds, rain and big waves can make it an unpleasant journey into the park. Some of the best months to visit Komodo National Park are April to June and September to November. These months are just outside the peak season making it a much more relaxing visit. Flights are generally cheaper and during these months there’s a higher chance of seeing Mantas and other large sea life when snorkelling or diving. 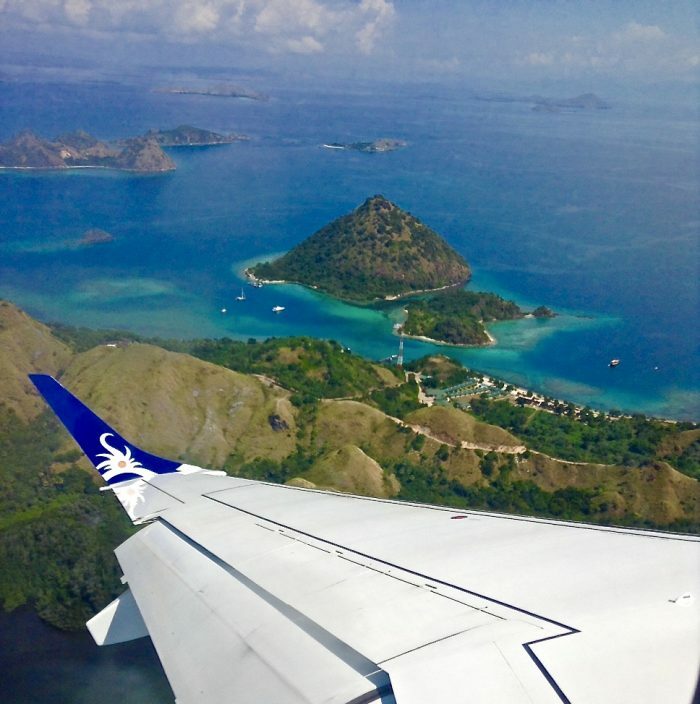 To get to Labuan Bajo there’s really only two options- fly or take a four day boat leaving from the Gili Islands or Bali. The boats are rumoured to be crowded and aren’t meant to be the safest form of transport. The seas between the islands can get rough, which is less than ideal when on a small boat. I’d personally recommend flying, plus the views from the plane are amazing (see above). Several flights a day leave Denpasar Airport with a few different airlines servicing the route. Prices can vary depending on the time of year you choose to visit. Certain times of the year you can get flights as low as $100 return. Garuda Indonesia also flies direct from Jakarta to Labuan Bajo as of late October 2016. 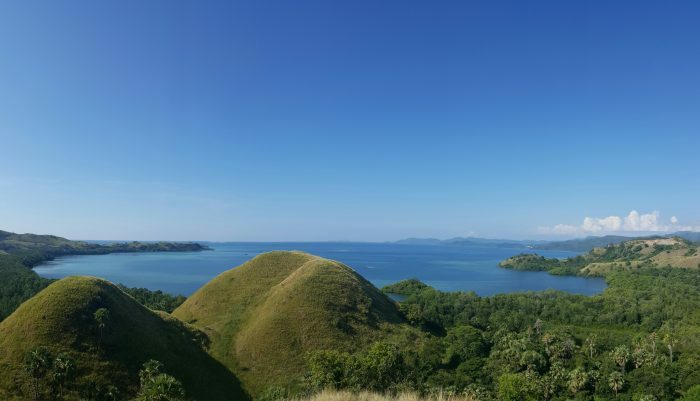 You’re really here for one thing and one thing only and that’s to visit Komodo National Park but there’s a few worthwhile spots to explore around Labuan Bajo which can be reached by motorbike. The one and two day boat trips into Komodo usually combine visiting the dragons, a couple snorkel stops and possibly a visit to pink beach or some other worth while spots around the park. Pricing can vary so try your hand at bargaining and be aware that the cheaper overnight trips will have really basic sleeping arrangements. 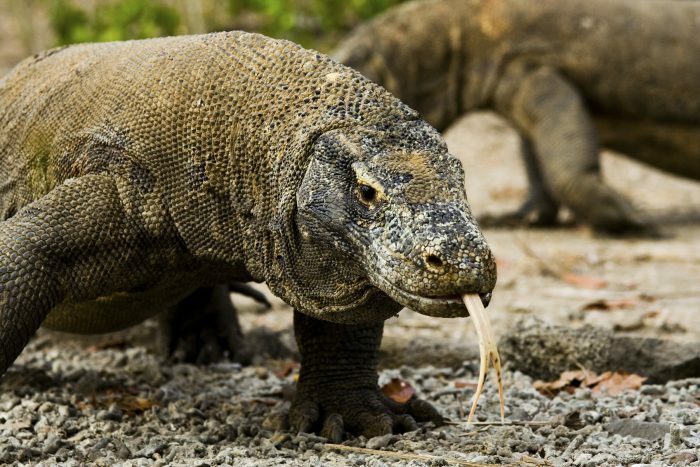 There are two islands where you can go to spot these giant lazy lizards- Komodo Island and Rinca. 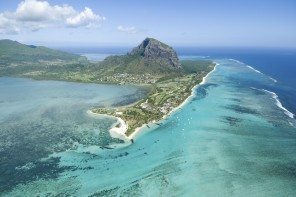 It’s easy to do a one or two day trip to one or both of the islands which also include some stops at beaches and at some gorgeous snorkel spots. Most dive operators also offer the option of doing two dives then a trek to Rinca to view the dragons (this option isn’t offered at every dive shop, ask around). Komodo Island is the larger of the two Islands and is a greener lusher spot to view the dragons but it’s also further away which means you’ll spend more time on a boat getting here. The negative with Komodo is it can be harder to spot the dragons in the wild because of all the trees plus the Island is so big many of the wild ones are hiding deep in the jungle. When you get to the island a guide takes you on a 30 minute walk to go “searching” for dragons but he basically lets you know you’re not likely to see them. The walk takes you in a loop up to a decent view point then back near the pier to the rangers station. This is where a few sleepy giants sunbathe and you’re basically guaranteed a sighting. Sadly it isn’t the most exciting way to view the dragons but they’re still impressively large and they can be extremely deadly. Rinca is the smaller and drier of the two islands. Here they have a higher population of Komodo Dragons and they’re easier to spot because the island isn’t as lush. Many people say Rinca is the better spot to visit the dragons. There’s no shortage of amazing dive spots within Komodo National Park for all levels of divers. The wildlife and coral is well protected especially for Asia and offers an array of big and little sea life. The waters are crystal clear and the fish are plentiful. 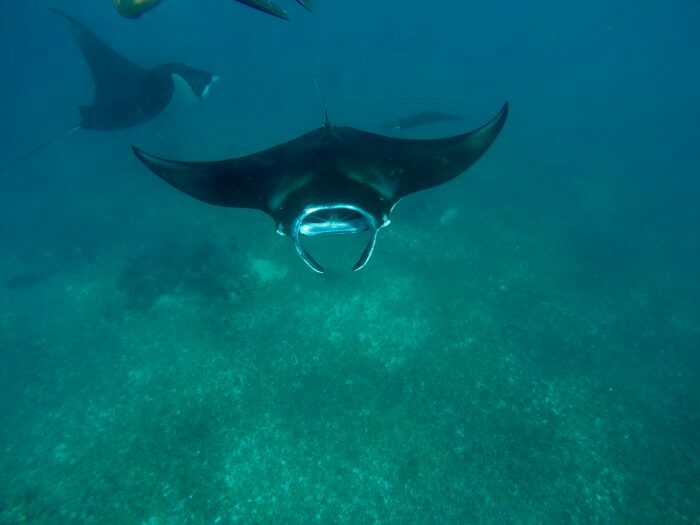 A highlight if you’re lucky and visit during the right time of the year gives you the chance to swim with schools of Manta Rays. Currents here can be pretty strong and certain sites you can only dive with an advanced open water certificate and experience diving in currents. 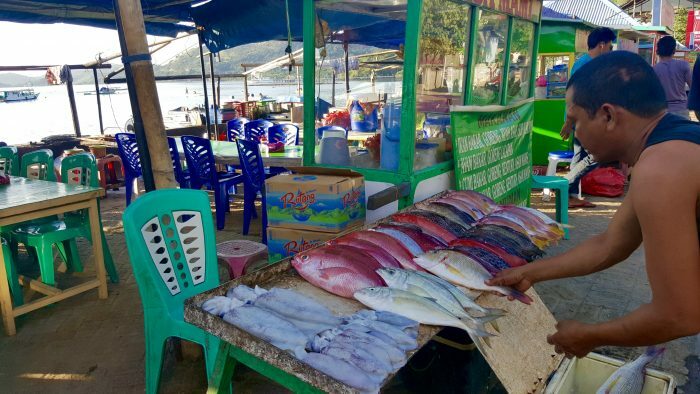 The main strip of Labuan Bajo has endless options of dive companies, almost all have good equipment, nice boats and expert dive instructors. Flores Diving Centre and Divine Diving both have extremely helpful staff and comfortable slow boats where you can relax on the deck between dives. The standard dive packages are three dives a day but you can opt to do less if it feels like too many for one day. Almost all dive shops also offer weekly liveaboards. Even if you’re not a diver you can still get up close and personal with the underwater wildlife on a snorkel trip. Either hop on a dive boat or enjoy the snorkelling on a one or two day boat trip to see the dragons. Manta Point (when the mantas are there) and Kanawa Island are both amazing spots to snorkel. 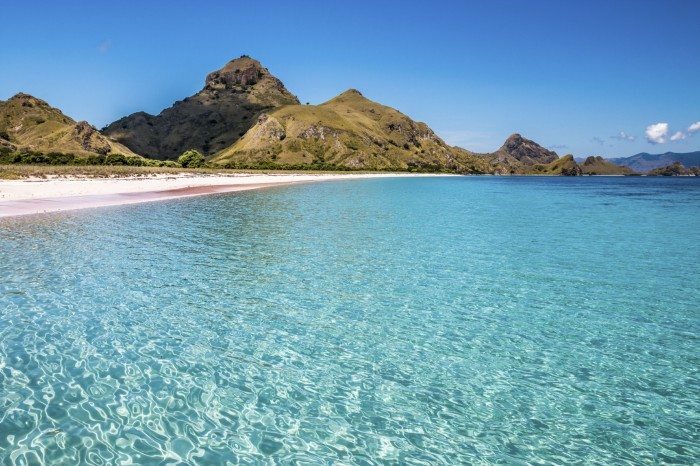 Padar Island is famed for its million dollars views over Komodo National Park. You won’t find any dragons here but a trek to the highest point will not leave you disappointed. You’ll have to check around to see if any tour operator is heading here or charter a boat. A visit to Padar Island isn’t on many day trip itineraries. Here you can also find a pink beach. 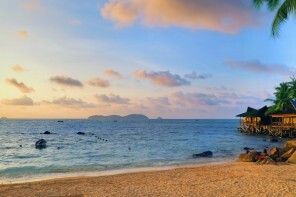 Bukit Cinta (love hill) is one of the most picturesque spots to watch the sunset in Labuan Bajo. With 360 degree views out to sea this is one not to miss look out spot. Rent a scooter or get transport to take you up here and don’t forget the camera. This beautiful cave is a well kept secret around Labuan Bajo although I imagine it won’t be kept a secret for much longer. 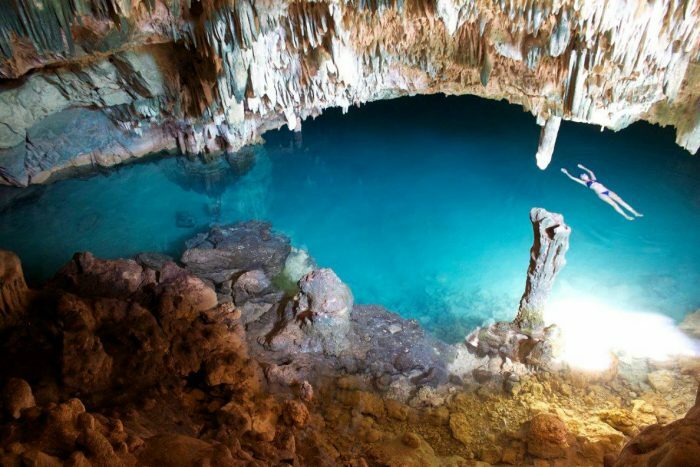 Part of the adventure of visiting this cave is the beautiful drive to get there and the friendly locals and smiling kids who greet you in the village nearby. From the village you take a short boat ride to a small beach where a 2 minute walk takes you to the mouth of cave. Here you can swim in the salt water pool found inside. Contact Filan Flores Komodo Tour if you want to take a day excursion to Rangko Cave by motorbike. Filan is a super funny and friendly local, English speaking, guide who can arrange day trips in and around Labuan Bajo. Hop on a scooter and head 30km outside of town to visit the pretty Cunca Wulang Canyon. After a short scenic walk you’ll be greeted by a gorgeous canyon with streaming waterfalls and river. Beware of the temptation to jump, the water levels can get very low and there’s been a few reported deaths. Don’t be surprised if you’re asked to take a local guide, although not really necessary you’ll likely not be able to get out of paying him and just keep in mind you’re contributing to the local community. Cafe.In.Hit- To get your morning caffeine hit head to Cafe.In.Hit for the best coffee in town. Grab your basic long black or spoil yourself with one of their specialty frozen coffees. They also have a display of tasty cakes and a fresh breakfast menu. They open nice and early from 7am so if you need a bite to eat before hitting the park this is your best bet. Le Pirate– With an extensive menu of Asian and Western delights at great prices Le Pirate is busy almost every night of the week. Here you can enjoy live music, happy hours and well priced Arak (local liquor) cocktails. You’ll also find some good veggie options here. Mediterraneo- The beautifully presented dished at Mediterranean are sure to impress. Although on the pricier side for Labuan Bajo, the food here is raved about especially the desserts. The upstairs area with low tables and bean bags is a nice place to relax after a day of sightseeing or when you feel the need to reconnect with the online world with their free wifi. MadeInItaly– For tasty thin crust pizzas and toppings you’d be surprised to find on a island in Asia MadeInItaly is an awesome dinner spot. Many of the ingredients here are imported straight from Italy. You’ll also find pretty views out to the bay to admire during your meal. Fish Market– Head to the waterfront in the evening for fresh bbq seafood at unbelievable prices. Here you’ll find the sidewalk comes alive with seafood stalls serving up fresh snapper, squid, crabs and giant prawns. Most stalls serve up your choice of seafood with a side of rice, salad, veggies and sambal (local chilli sauce). Certain stalls also serve up other local delights like gado-gado for the vegetarians and fried chicken for those who aren’t big seafood fans. Blue Corner- This is the spot for cheap local eats. This unassuming warung (local family run restaurant) serves up nasi goreng (fried rice), mie goreng (friend noodles), fried chicken, and plenty of vegetarian options such as fried tempe. Perfect for a quick snack or budget friendly lunch and dinner. There’s plenty of accomodation along the main strip of Labuan Bajo, making it an easy place to base yourself when diving and doing day trips into the park. If you’re after a quieter spot with some good views look for a place on the hills just outside the main strip. Otherwise for keen divers not on a budget there are some dive resorts and beautiful ships that offer liveaboards into the park where you can experience diving the waters before anyone else arrives. For the liveaboards you can book ahead or drop into any of the dive shops on the main strip and find out when their next boat leaves (this is generally every few days). Outside of peek season it’s pretty easy to jump on a boat once you get to Labuan Bajo. During peek season it’s best to book ahead. Le Pirate Labuan Bajo– The newest and nicest accomodation to hit the main strip of Labuan Bajo, Le Pirate has small but cute and bright rooms complete with a tiny porch to relax on. 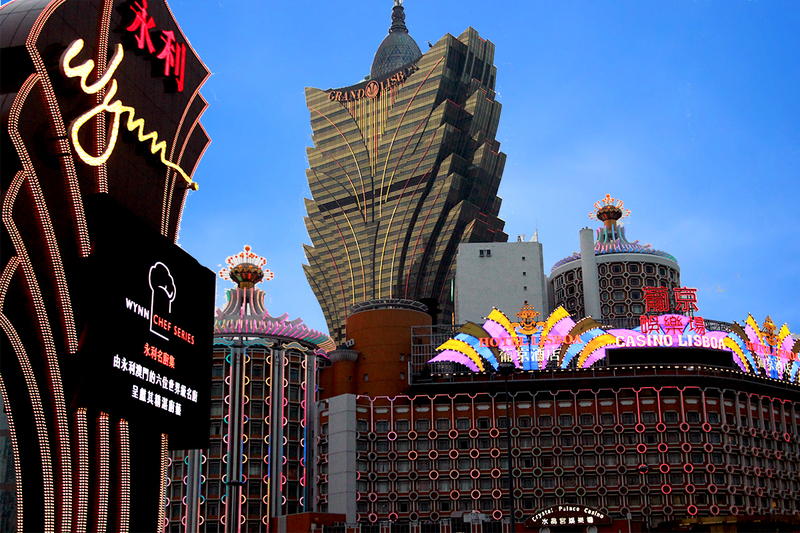 Here you’ll find a small rooftop pool, nightly music, outdoor movie nights and a lively restaurant and bar serving up well priced and tasty food and drink. Starting from IDR 400k. Golo Hill Top– Located on the hill before you enter the main street of Labuan Bajo, Golo Hill Top offers expansive views over the bay from their clean and simple rooms. Here you can relax by the pool while taking in the views. Prices include breakfast and it’s an easy down hill stroll into town or hop on the back of an ojek (motor taxi) if you don’t feel like making the short hike back up. Starting from IDR 550k. Komodo Resort Diving Club– For a truly secluded stay right in the thick of the nature action, Komodo Resort is the spot to be. Located on a small Island a short boat ride from Labuan Bajo, this rustic accomodation offers full board and dive packages for a minimum of a 4 night stay. Hike around the Island, snorkel off the beach or just relax on your porch in absolute bliss. Check the website for package pricing. Gardena Hotel- For a budget friendly option on the main strip, Gardena is a pretty safe bet. Very basic rooms with the option of fan or ac. Be prepared to climb a few steps to get to your room and don’t expect too much. Rooms start as low as IDR 130k.